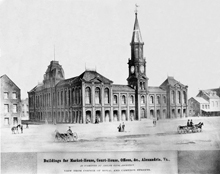 After a fire destroyed the Alexandria City Market House in May 1871, Adolf Cluss drafted plans for a new building, following an expanded footprint of the original market hall, using a U-shaped configuration with central courtyard. The lower west and north sides of the building accommodated market stalls, while town offices occupied the upper floors of the west wing; Masonic Lodge rooms were housed on the upper floors of the central (north) wing; and police and fire stations were located on the lower east wing with court rooms above. Additionally, the new structure incorporated an exact replica of the town clock tower, designed by Benjamin Latrobe in 1817, fully funded by Alexandria residents. During construction, Cluss often visited Alexandria to meet with the contractors. On October 31, 1871, the Alexandria Gazette reported that Cluss ordered the rebuilding of an interior wall since it "had not been put up according to the provisions of the contract." By July 19, 1873, however, Cluss was pleased with the results, stating that the nearly completed building was "one of the best jobs that ever came within his knowledge." Cluss had chosen the Second Empire style, with a five-part plan which emphasized the central entrance pavilions and incorporated minimal façade ornamentation. One notable exception was the inclusion of carved Masonic symbols on window lintels along the north façade. In 1944, the Masonic lodge moved to new quarters at the Washington National Memorial. A mid-twentieth century renovation razed the market house, made additions in the center and altered the façade on south side in a colonial revival style. However, Cluss's original design remains evident along Cameron Street, where the Masons have honored Cluss's achievement with a plaque near the entrance.